"The price goes up, they don't buy any less,"
PORTLAND -- Pacific Northwest soft white wheat growers must rely on the quality of their product to maintain an edge in the highly-competitive export market, speakers at a Dec. 5 media briefing said. Cheaper wheat is available from Russia, the Ukraine and elsewhere, but buyers in Japan, Korea and Taiwan are "premium buyers" who remain willing and able to pay for Northwest wheat used to make crackers, cakes and cookies. "The price goes up, they don't buy any less," said Steven Wirsching, director of U.S. Wheat Associates, a trade group that maintains offices in Portland and Arlington, Va. Sales to North and South Asia are so critical -- the Philippines and Indonesia are also among the top 10 customers – that seven of U.S. Wheat's 15 international offices are in Asia. The premium Asian buyers are notoriously strict about wheat quality, he said. "Certainly, market development is a full-contact sport," Wirsching said. Wheat is the world's most widely planted grain, Wirsching said, and provides 20 percent of the world's calories. In the world's poorest regions, wheat provides 20 percent of the protein, he said. Blake Rowe, CEO of the Oregon Wheat Commission, described the "quality loop" in place that brings new varieties on line, protects growers and satisfies the demands of overseas buyers. He said it can take eight to 12 years to develop new wheat varieties with the yield, quality, stress and disease tolerance that make them worthwhile for growers. New Northwest varieties are tested with three years of data from 15 sites, and are always grown side-by-side with and compared to the Stephens variety, the industry standard. The growing, handling, storage and shipping of wheat is carefully monitored, he said. If something goes wrong on the farm, or at the elevator, it resonates down the line of trade. Japan, he said, tests wheat for 220 pesticide residues. In markets such as Japan, the end use of soft white wheat is in such things as sponge cake, and consistent presentation and look of the finished product is crucial, Rowe said. "They understand pretty much everything you want to know about wheat and what products they can make from it," he said. "Quality is a priority for us. If the only way we have to compete is on price, we will lose some markets." On another topic, Rowe said it's unclear how a Trump administration will handle agricultural issues such as the next farm bill. As of Dec. 5, when Rowe spoke at the Portland briefing, Trump had not appointed an agriculture secretary to replace Tom Vilsack, who is wrapping up eight years at USDA under the Obama administration. While Trump has no history with farming, wheat growers are comfortable with Vice President-elect Mike Pence's agricultural background as Indiana governor, Rowe said. "Right now we have to wait a little bit," he said. "We will get there." Rowe acknowledged the Trans-Pacific Partnership, which export-heavy Pacific Northwest farmers favored, is "not going anywhere in its current form." Trump was highly critical of the TPP during the election campaign, but whether he intends to scrap it or re-negotiate it is unknown, Rowe said. It's clear Trump intends to roll back regulatory acts such as the EPA's unpopular "Waters of the U.S." proposals, "But the specifics of that we have to wait and see," Rowe said. Wirsching, of U.S. Wheat Associates, noted that the Columbia and Snake river systems will be closed to wheat barge traffic as locks and gates at dams are repaired and updated from Dec. 12 into March 2017. He said the industry will move wheat from up-river elevators by using other transportation modes, primarily rail. He estimated there will be market demand for 1 million metric tons of soft white during the closure. He said such repairs are done every 50 years and will provide long-term benefits to trade. "A planned closure is better than an unplanned accident," he said. "We feel we can easily handle the closure." The media briefing was organized by BASF, the German company that produces ag chemicals. Jim Vandecoevering, technical services manager with the company's Western region office in Boise, said growers face challenging times. Growers of many types had excellent yields in 2016, but weak commodity prices are likely to result in a seven-year low in farm income, he said. "It's a risky business, the biggest job on earth, as we say," Vandecoevering said. "Unfortunately, U.S. consumers don't recognize the importance of farmers and the crops they produce." There is more land planted to wheat in the world than any other crop. It provides 20 percent of the world's caloric consumption. Farmers in wheat growing areas of the country served only by the railroad are called "captive shippers" because they have no other way to get their wheat to market and transportation prices are correspondingly high. Washington farmers aren't captive because of the 360-mile long Snake/Columbia River system between Lewistion, Idaho and Portland Oregon (CRSO.info records this as a 465-mile navigation corridor). Barge traffic on the river is the most efficient - and cleanest -- frmm of transportation available. A tug pushing barges can haul a ton of wheat 576 miles on a single gallon of guel, compared to 413 miles by rail and 155 miles by truck. And tugs have one-third the emissions of rail and one-twentieth the emissions of truck, per ton-mile. An average of 60 percent of Washington wheat moves by barge to Portland. Two companies, Tidewater and Shaver, compete for farmers' barging business. In 2014/2015 the United States exported nearly 835 million bushels of wheat to 68 countries around the world. That's almost 50 percent of the wheat produced in America. 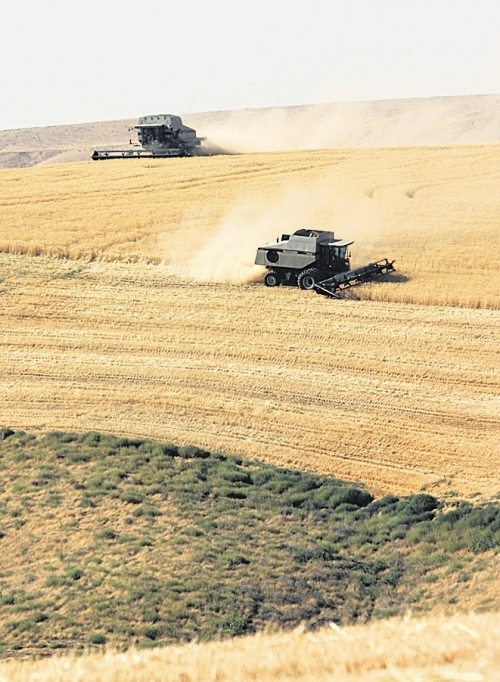 About 49 percent of U.S. wheat is exported from seven ports located in Washington and Oregon. Cargo ships known as bulk freighters transport 2.4 million bushels of wheat at a time to quality conscious customers in Asia, Latin America and North Africa. Smaller shipments of wheat leave the country in containers, those steel boxes used to transport goods around the world. Although a container only holds about 750 bushels of wheat, some buyers prefer smaller quantities of the highest quality wheat for specialized uses. Other millers in remote locations use containers because they also serve as convenient storage facilities. BNSF, which dominates the rail shipping needs of Washington wheat farmers, has turned to shuttle train loading facilities as a more efficient method to move grain as inexpensively as possible. These facilities are set up to load 110 cars in 15 hours or less, and they move to market as a unit. Washington has four shuttle loading facilities. BNSF boasts a network of 233 shuttle loaders across the U.S., a 200 percent increase since 2000. Union Pacific, the other Class I railroad operating in Washington, does not have access to a shuttle train loading facility.